Usually I get post ideas by overthinking everything. Over the last few weeks, life has become so boring that I’m trying not to overthink everything because it drives me crazy (in a bad way). Seriously people – all I do is go to physical therapy or do my exercises. I socialize a bit but not enough to take up most of my week. So in my effort to not obsess, I’ve deprived myself of my main source for blog post ideas. This isn’t all bad though. Boring can be positive, just like “exciting” can be negative. Focus on my writing projects has drastically improved. I actually finished the first novella in my series and started the next one. Define Reality 2 is going well thanks to my outline. Meanwhile, a random burst of inspiration led to the outline for a short story. I’m going to enter it in contests when it’s written. I’ve said this before, but when my Define Reality series is complete, I also plan to query agents for the first time ever. This is the first project I’ve felt comfortable enough to send into the world (as in the world of publishing, instead of just posting online). Recently, I wrote a post listing all the writing techniques I’ve accumulated over the years. I think it’s finally blended together to form a sustainable writing practice. The ideas I build on lead to full outlines, and I spend more time worrying about character voices or themes. I finish first drafts then still want to edit them. I’m still not comfortable volunteering details about my work “IRL” (because who honestly cares?) but I would send it to people if they asked to read it. I’m ready to query agents. I’m ready to consider criticism and edit a piece until it works. Maybe, when my knees are taken care of, I might look into writing classes with the intention of actually taking them. Hell, maybe I should look into online programs now. (Though I can’t help feeling creative writing courses are a waste of time at this point – I’d rather just write.) This might be the boredom talking, but I’m ready for the next step – whatever it turns out to be. “Pantser” and “Planner” are terms I picked up from then NaNoWriMo community. While I gave up on ever writing 50K words in a month (I prefer my own pace because forcing a story never works for me), I still support those who take on the challenge and adopt some of their philosophies. A Pantser is someone who writes by the seat of one’s pants, meaning without an outline to guide them, while a Planner…well, plans. Neither label is better than the other – in my opinion – and the choice completely depends on the individual. Until recently I was a Pantser. Whenever I got inspiration for a new idea, I’d be so excited about it and start the first chapter right away. Then I would hit a wall by the second chapter. At most I made up scenes as I went. This alone made me abandon many stories because I never bothered to chip away at said wall. I’d lose interest in the idea, conclude it wasn’t as great as I thought it was, and move on to the next Great Idea. I never wanted to stop and re-examine the characters, plot or potential themes. My inspiration moved on so I went right along with it. Inspiration is a tricky devil. It makes mediocre ideas THE BEST THING EVER and distracts me from investing in my current work. Before the story had any depth, I’d get distracted by the shiny new idea waiting to be developed. Without an outline or any idea of how the middle will flow into the conclusion, I had difficulty committing to the story. Why bother when a dozen other ideas sound much better than the one right in front of me? My novella series “Define Reality” turned me into a Planner. It originally started as a television script, so for once I already had every single plot point mapped out. This made a huge difference when I finally wrote the novella version. I could focus on characters and theme instead of worrying about where the hell I was going with all this. Oh sure, I still had to figure out a bunch of stuff along the way, but the basics were there. I also felt comfortable adding things knowing how they fit into the overall picture. Even though I didn’t write the novella in a thirty days, I finished in less than six months and was happy with the results. I think I will always “pants” a little bit. There will be times when I’ll go totally off-outline and add in scenes I concoct during the writing process. Going forward though, I want to put more effort into outlining the whole story. If nothing else, it’s a relief to know I won’t end up in the Middle of Nowhere without map. 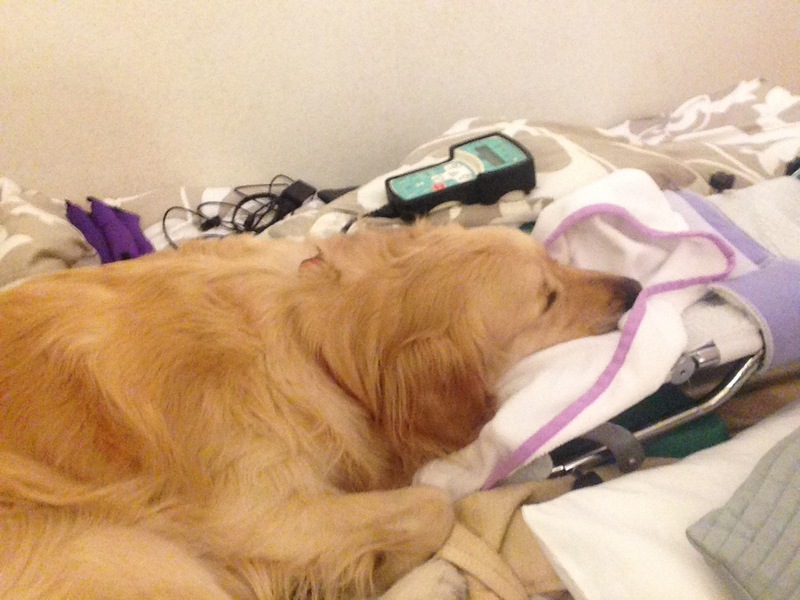 I don’t normally post photos, but since I talk about recovery so much, here’s a picture of my Golden Retriever taking a nap on my Continuous Passive Motion machine because he’s scared of the fireworks. Happy 4th everyone!